Today was a day of dog management and hard trail work. Leesa and I were watching my son's dog Lulu for the weekend. Lulu is a young Pitbull mix who has not been through any training yet, and is not ready to be off leash. 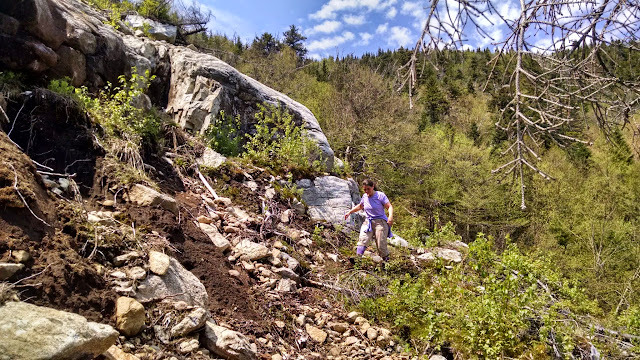 We decided to do some trail work on the Hoffman Notch Trail. 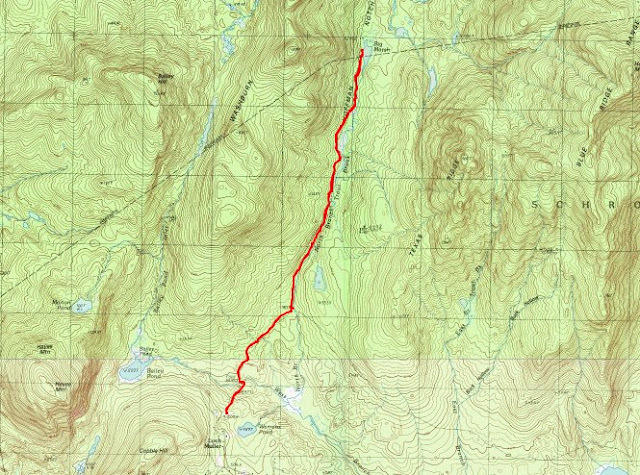 I clipped Lulu to my carpenters belt and we headed north from Loch Muller on the trail. The goal for the day was to add trail markers where needed and replace old faded markers. Leesa had loppers and I had a folding Sven saw to cut any small limbs out of the trail. Unfortunately, my remaining supply of yellow trail markers was not enough to complete the job. I ran out just south of Big Marsh. 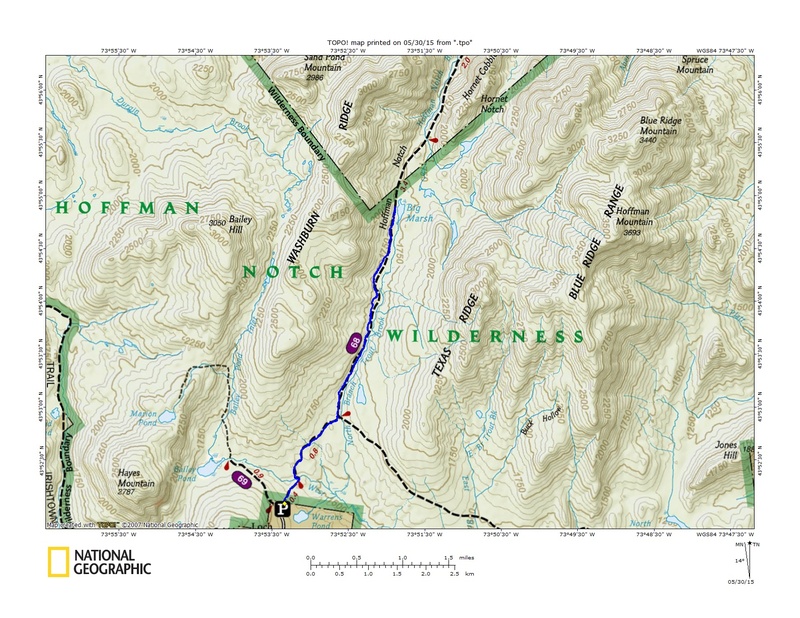 The northern half of the trail has already been done, but I'll have to get more discs to finish the southern half. We were kept busy however clearing limbs from the trail. I used my Sven saw quite a few times. I found that while it's easy to add trail markers with a dog clipped to my waist, it's a bit harder to clear limbs. Leesa did a little work with the loppers, but we need to coordinate a volunteer work day because there is a lot of sidecutting that needs to be done throughout most of the trail. Lots of hands would make the job more manageable and more fun as well. Since we were almost to Big Marsh, we continued on to take a look. Leesa had not seen it before in summer. The last time she was there, it was 20 degrees below zero! Big Marsh really does have water in it. It was warm and muggy and we got quite hot. We both had long sleeve pants and shirts to protect against bugs. Leesa wore a head net as well. The bugs seem to enjoy her more than me. Do you see a trail? 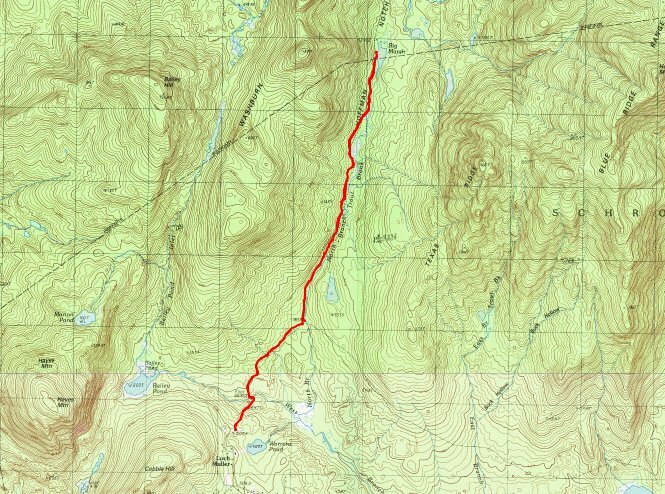 One nice thing about this hike is that the trail parallels the North Branch Trout Brook for the southern half of the hike and the Hoffman Notch Brook for the northern half, so you are never far from water. The dogs appreciated that, especially Lulu. Water is a magnet for her, while Rev only wades into water if she is thirsty. I had no problem finding a hike today to avoid the holiday hiking crowds. A bushwhack hike in the Hoffman Notch Wilderness did the trick. I did not see another human all day. 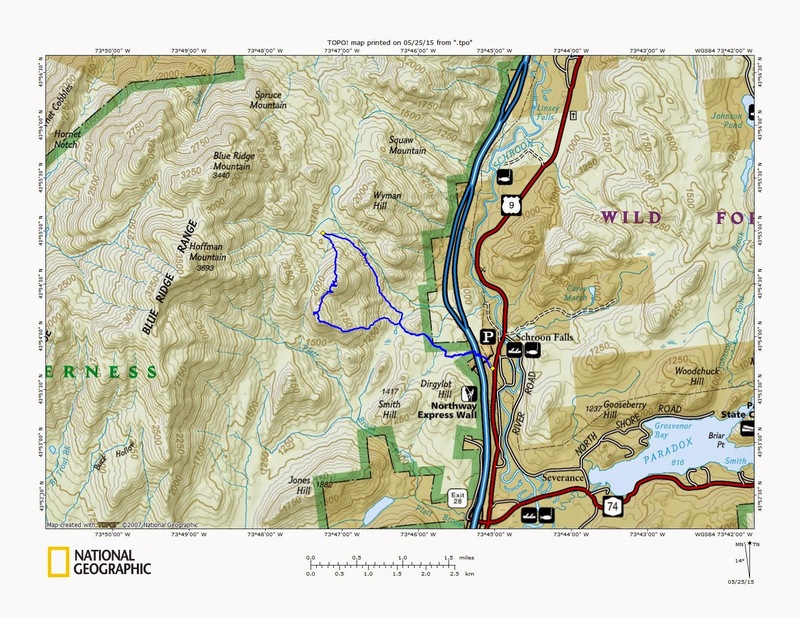 I parked at the Dirgylot Hill trailhead on Route 9, just north of I-87 exit 28 in Severance. 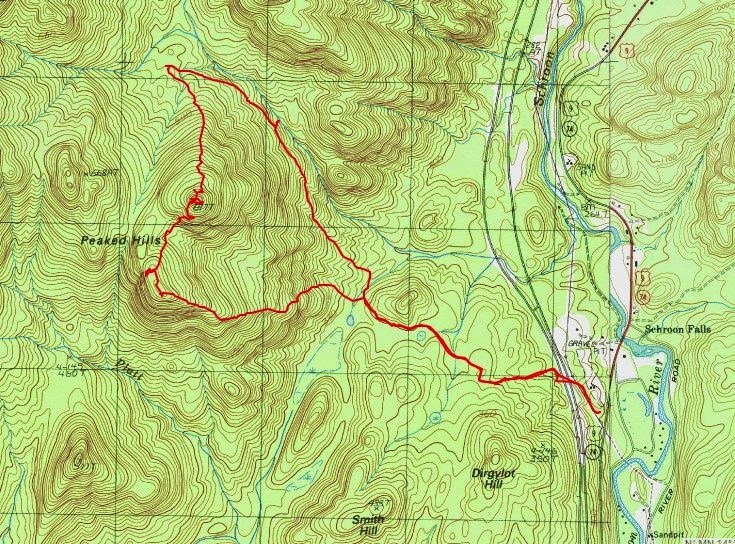 On tap for today were the hills labeled "Peaked Hills" on the topo map. I've wandered much of the surrounding area, but had not yet been up these hills. I followed the old woods road to the first tee, then turned right. The woods road continues a short distance, and becomes a herd path with evidence of old hatchet marks on trees. The herd path leads to 17th brook where another old woods road parallels the brook. 17th Brook typically has a decent amount of water flowing through it, even in dry times. Such was the case today. We've had a dry spring, but the brook still provided some nice waterfalls along the way. I followed 17th Brook past the eastern face of Peaked Hills and continued on until I was at the toe of the northern slope. I decided to tackle the "East Peaked Hill" and "South Peaked Hill" and save the 3rd and last "West Peaked Hill" for another adventure. I now went almost straight south to climb the East Peaked Hill. Travel was quite easy until I was near the very top. Soon afterward rock slabs broke the summit open. I hadn't expected so much rock on top and it was nice to have great views north, west and south. The summit of East Peaked Hill. Hoffman Mountain and Blue Ridge Mountain in the background. It's a tough life for trees here. Rev's waiting to see which way I'm going next. From East Peaked Hill, I was going to head west to get off the summit, then go south to South Peaked Hill. I ended up going south immediately. It was doable, but steep with lots of ledges and sloping rock and I had to search hard for a way down. 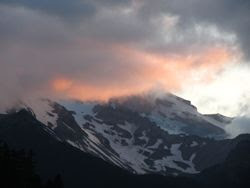 Once I was in the col between the two, it was easy climb up South Peaked Hill. This one had a different feel. The summit was a beautiful red pine forest, but the west face had a large rock slope that provided a vantage point. Very nice. Both of these peaks are well worth the visit. Hoffman Mountain in the background from South Peaked Hill. Rev's waiting for me to come back up. Another angle of the west face of South Peaked Hill. A harsh place in winter I'm sure. Lots of blueberries in another month. Cruising around South Peaked Hill. To leave South Peaked Hill I headed East SE along a nice gentle ridgeline to complete a loop hike. I came back to the herd path just south of its' junction with the 17th Brook woods road. Just a boulder catching some shade. I quite enjoyed this loop. I'll be doing it again to show Leesa since she didn't join me on today's adventure. I also saw some other distant hills that looked promising and are now on my short list for another trip! Leesa chose todays trip which ended up being a double header. Part 1 - Wilmington Slide. She felt like climbing a slide today and I thought Wilmington Slide sounded like what she was after. I had climbed it twice last winter, but had not seen it in summer. She agreed with my suggestion, and off we went. We parked at the intersection of Bonnieview Road and John Bliss Road. There is a pull off there that hikers use. 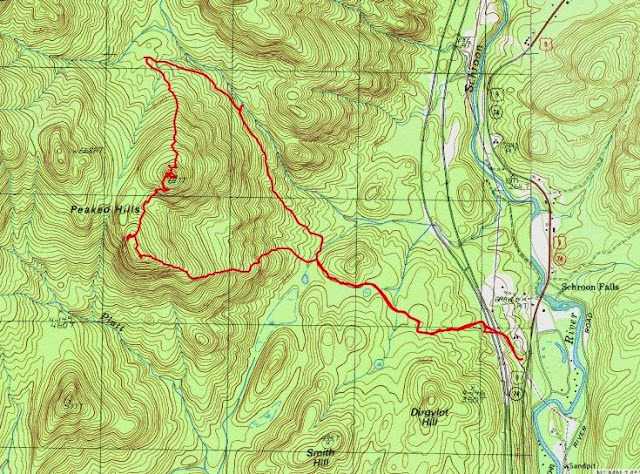 Our first 1.5 miles were an easy walk on the Cooper Kiln Trail, which is an old woods road. This is an excellent cross country ski trail in the winter for those who like nice long hills with moderate grade. We were expecting the day to feel hot and perhaps buggy, but there was a nice breeze and the air felt dry. Needless to say, bugs did not bother us all day. Out on the slide we just poked along enjoying the day. We looked for interesting rocks and by moving slowly and keeping my heart rate down, my sinuses were not aggrevated any worse than they already were. In winter, I had avoided lower headwall due to ice. Today, we climbed the lower headwall before giving in to the upper headwall. Leesa didn't care about going into the woods to reach Wilmington Peak which was only a quarter mile away. I had already done it, so we decided to turn around at the bottom of the last headwall. On the way down, we followed the slide a little lower before cutting back to the trail. We the slide finally narrowed and formed more of a ravine we went back to the trail and back down to the car. Looking down the lower part of the slide. This was also Leesa's idea. She wanted to see this bog trail which she had noticed on the National Geographic map. We still had some time in the day, and it wasn't far away, so we went to check it out. We found the trail to be quite nice. The first portion, which goes through the bog is on a raised boardwalk the entire way. It is ADA accessible and has turnouts at regular intervals. The bog is certainly something worth seeing and the boardwalk makes it easy to navigate. 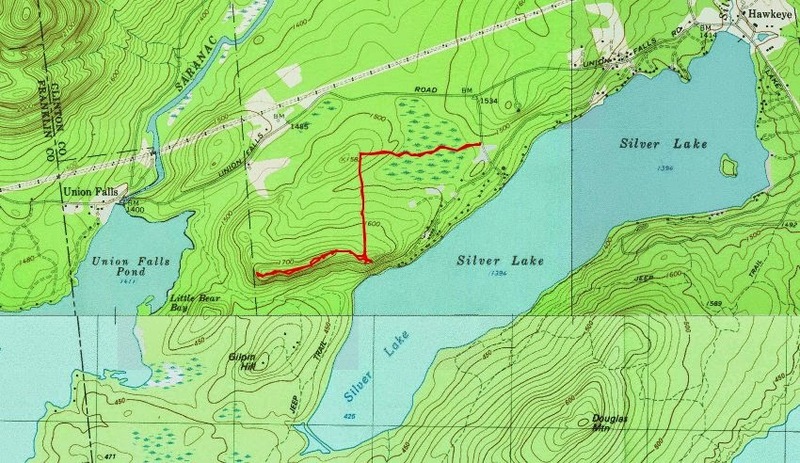 At the end of the bog, the boardwalk ends and hikers that are inclined can continue on the footpath to "The Bluffs". 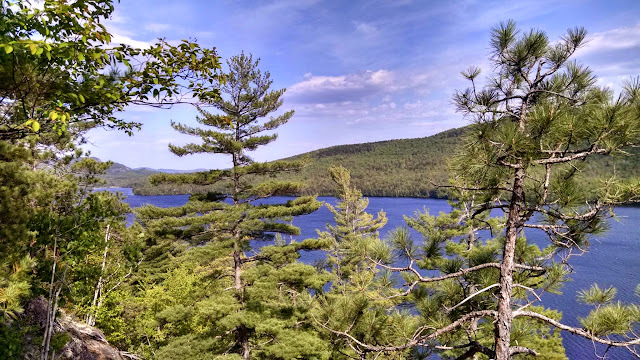 The trail takes you to an un-named ridge that offers a nice look down to Silver Lake and across the way to Catamount, Esther and Whiteface Mountains. It appears that persons with an adventure of spirit, have continued along the ridge on an unmarked heard path that comes and goes. 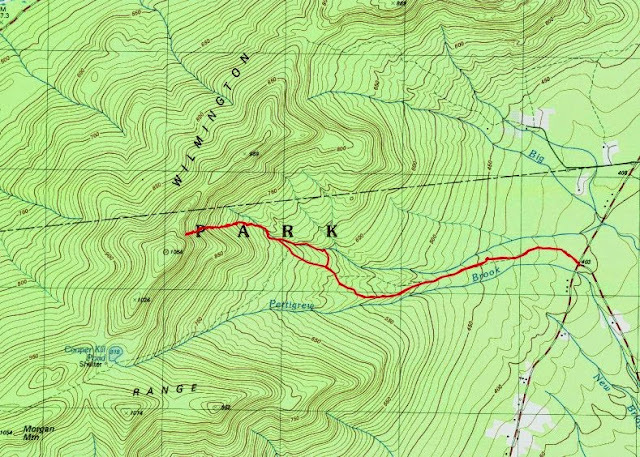 The ridge is lightly treed and is easy to navigate. We followed the unmarked route which hugs the southern portion of the ridge. There were almost continous views of Silver Lake. The western end of the ridge hosted a beautiful stand of red pine. At the western end of the ridge, a brisk breeze was quite refreshing. WE returned the way we had come to end a nice day of hiking.